Ever feel like there are never enough hours in the day to get everything done? There are emails to write, healthy recipes to try, the kitchen junk drawer to reorganize, gardening to do, books to read, rooms to tidy…and the list goes on. Sound familiar? Life can be hectic. We’ve got work, errands, kids, and more to keep us busy. With so much going on and so much to take care of, it’s important to remember to take time to slow down, cut the distractions, take care of ourselves and appreciate life’s precious moments. Today we explore the sixth lesson from centenarians living in the Blue Zones, unique communities that have common elements of diet, lifestyle and outlook on life that have led not only to an amazing number of years lived, but also to a better quality of life. In preparation for our upcoming Healthy Lifestyle Challenge, I’m reposting (this time with recipes) all nine lessons from the Blue Zones (BZ). The lessons are simple, yet powerful, and can help put anyone on the path to a healthier and happier life. Although their bodies naturally slow down due to age, Blue Zone centenarians know the importance of slowing down and appreciating life’s most precious moments that can often pass by much too quickly. To be honest, I find this lesson the hardest of all the BZ lessons for me to put into practice. I love to multi-task. At any given moment I can easily be working on multiple projects at the same time. It both energizes and exhausts me. I like to think I’m being super-efficient, and oftentimes I am, but it often comes with a price. I’m usually rushing from one activity, project, appointment, etc. to another and honestly, I don’t always take time to stop and “smell the roses”. Having a little one has helped me to put things into perspective. Watching him grow reminds me of the importance of slowing down, so not to miss all the precious moments life has to offer. He plays well on his own, but there are times when he asks me to sit down next to him while he plays, or to read a few more books with him, or to just snuggle on the sofa for a bit. It’s during times like those where I’m forced to slow down and be mindful of his need for quality time with me. I’ve heard that people who make it to 100 years old often seem to exude a sense of sublime serenity. They’re aware of the importance of improving their lives through simplification and not only wise enough to know how to take it easy, but also have a keen understanding of limitations of the body. Whether I live to be 100 or not, I hope to start learning how better to slow down and develop a more refined and serene attentiveness to the people and things that are most important in my life. How about you? How easy (or hard) is it for you to slow down? Tips and strategies to find a quiet space and slow down. Reduce time spent with T.V., radio and the Internet. It can lessen the amount of aural clutter in your life. Most electronic entertainment just feeds mind chatter and works counter to the notion of slowing down. Plan to arrive 15 minutes early to every appointment. This one practice minimizes the stress that arises from traffic, getting lost or underestimating travel time. It allows you time to slow down and focus before a meeting or event. Create a quiet space at home that is not too hot, to cold, too dark or too light. Make it a comfortable space. Establish a regular time to meditate and/or practice yoga everyday, no matter what—but don’t stress out on the days you cannot! Finding time for our spiritual side can create the space to slow down. Practices like meditation and yoga can also give the mind a respite. Regular meditation can allow us to slow down our minds, ridding them of the incessant chatter in our heads. It focuses concentration and allows us to see the world as it really is, instead of how we imagine it to be. At first I was planning to use my red and golden beets to make a hearty soup, perhaps with an interesting grain like kamut or wheat berries. Then, the idea of a warm and multicolored salad came to mind. Quinoa then seemed like the perfect companion. 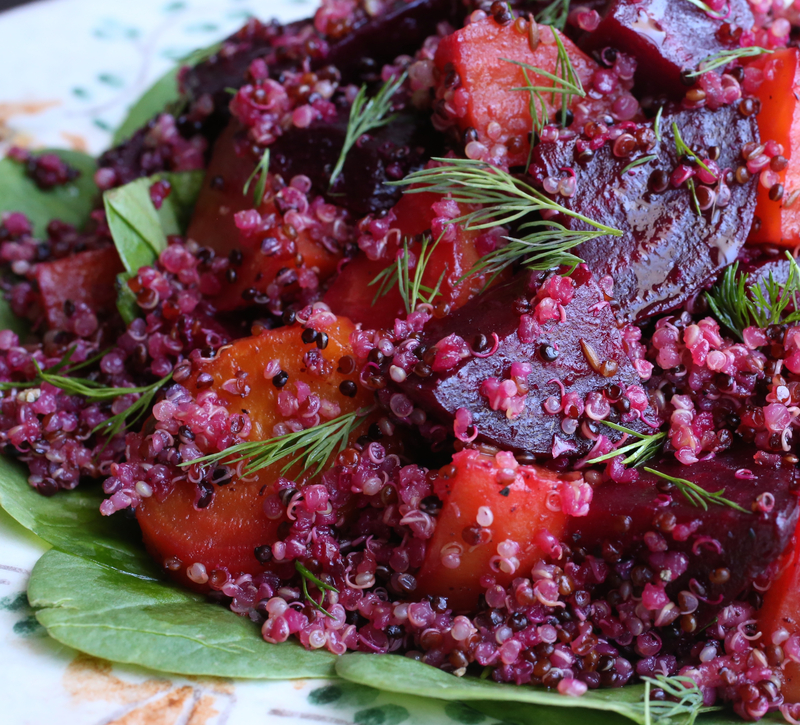 The mild sweetness of the beets pairs nicely with the earthy nuttiness of quinoa. I love the combination of color and texture. This sale is flavored with a simple dressing that contains a hint of sumac that gives it subtle and nice tangy kick. Preheat oven to 400F. Individually wrap beets in aluminum foil. Bake until tender when pierced with sharp knife, about 35 minutes to an hour. Cooking times depend on their size. Meanwhile, make the quinoa. Heat olive oil in a saucepan, add cumin seeds and cook until fragrant, a little less than a minute. Add quinoa and stir for another minute or so. Add water, and salt (optional). Bring to a boil, then simmer, covered. Cook until liquid is absorbed, about 20 minutes. When the beets are ready, unwrap them and peel with a knife while still warm. Cut into quarters, 1-inch dice, and/or slices. 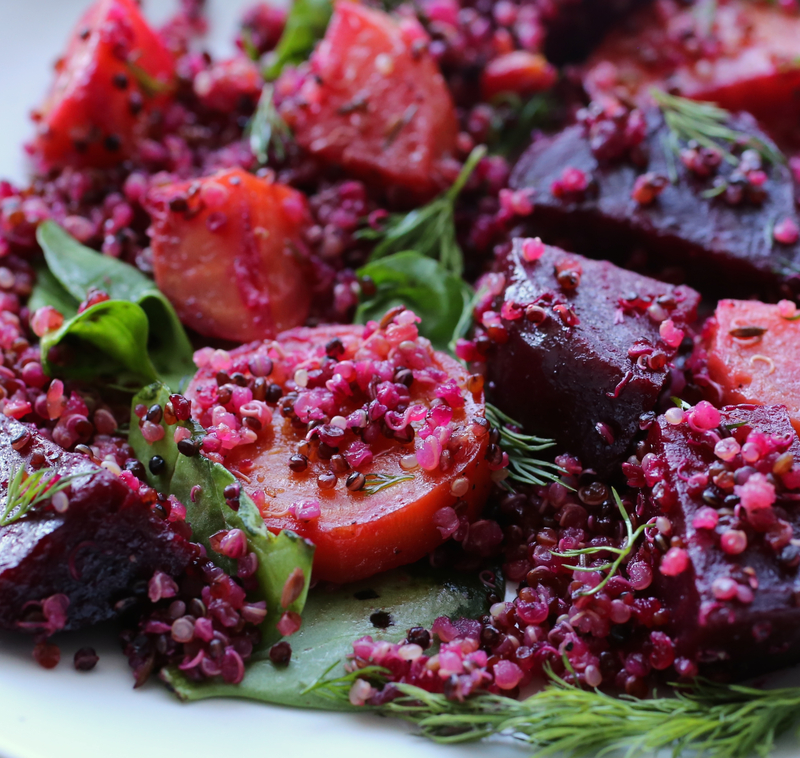 In a large bowl, combine beets with quinoa, dill, spinach and dressing. Toss well and taste. Adjust seasoning, if necessary. Garnish with more dill and serve. *Sumac, a dark red powder, is a spice made from the crushed berries of a small Mediterranean tree. It’s traditionally used to give a sharp, acidic and tangy kick to salads, roasted meat or fish, and hummus. Notes: If you prefer, you can make a little more of the dressing if you find you’d prefer it with more. Or, make more and serve it on the side. Also, if you find the dressing is not as sweet as you’d like it, add a little more maple syrup. As my toddler eats what we eat, I like to keep things mildly sweet. Oooh sounds wonderful and the colour is magnificent! Thanks Millie!!! So nice of you to say! I love beets, and I am going to try this this week! Promise!!! Oh good! Please let me know how you like it! I hope you you do!